The developer has filed their planning application, which the Society supports. The scheme would reinstate the terrace with materials to match the existing Portland Square elevations. The Society has made constructive criticism and has asked that new build properties be in the original form with a staircase to respond to the existing Nos. 30 & 31. Historic England, the Portland and Brunswick Squares Association and the Society have said that the new Surrey Street elevation does not enhance the character of the conservation area. There should be a more vertical articulation. There are further comments about the increase in unit numbers over the current unbuilt permission, the accommodation mix, including the affordable housing provision, artificially lit internal access corridors and single aspect flats. The Society welcomes the possible restoration and reoccupation of this final corner of Portland Square. Portland Square was laid out over 200 years ago. Most of the Square has been restored. The exception lies in the northwest corner where there is a gap, caused first by war damage and then by neglect. The current proposal is to redevelop the site completely to provide 92 flats. 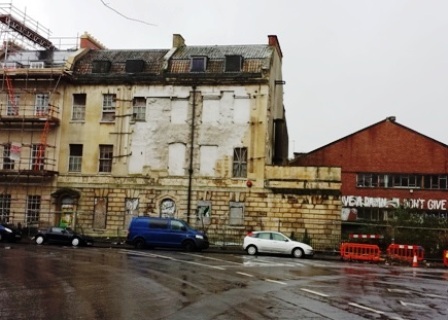 The scheme would demolish the former cash and carry warehouse, restore the Grade 1 listed buildings Nos. 31 and 32, build new buildings in the gap site, Nos 29 and 30 Portland Square and 1 Cave Street. There would be new residential building facing Surrey Street and Brunswick Cemetery Gardens. Despite the Society’s enthusiasm for the restoration of the Square there are two major concerns. The developer offers reproduction elevations to the Square in brick and not Bath Stone. All other buildings restored following war damage are stone faced. The accommodation has increased by 50% above the accommodation permitted by an expired planning permission. This increase in density may have adverse consequences for the amenity of the future residents. The plans are not yet finalised to support a planning application. The Elevations to Portland Square are definitely STONE. The full application has now been submitted. The Elevations to Surrey Street and Brunswick Cemetery are brick to match existing adjacent properties. Brick elevations – what is the developer thinking of?